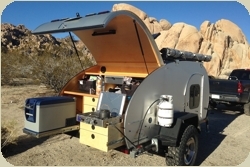 So-Cal Teardrops produces the finest "Teardrop Trailer!" From mountains, to desert, to beach, we have the model for you. A road, crossover, or off-road trailer will get you to camp in comfort and style! With the ability to be towed just about anywhere, So-Cal Teardrop Trailers are ideal for the camper that likes to get away from the crowds. These tiny, towable, airfoil-shaped trailers that were all the rage in the 1940s and 50s. Eclipsed nearly half a century ago by hefty RVs and motor- homes, these streamlined tag-alongs have made a big comeback among the camping crowd. The Teardrops' resurgence has grown out of a need for a light camper that can be towed by a smaller, more fuel efficient vehicle, with a comfortable bed for two and a galley, both sheltered from the elements. 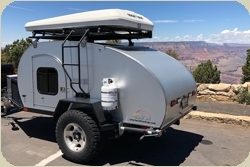 So-Cal Teardrops has painstakingly re-engineered the "original" Teardrop trailer, with modern materials and technologies, while maintaining a hand fit and finish. 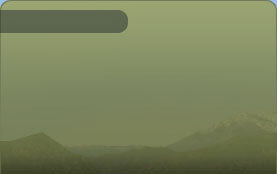 All models come standard with all the items listed in this FACT SHEET. All trailers are manufactured in Upland, CA. Delivery to the Continental U.S. is available. Come by and visit us. You can also call or e-mail us today to get your trailer "rolling" and become one of the many "Happy Campers" to own a So-Cal Teardrops trailer.